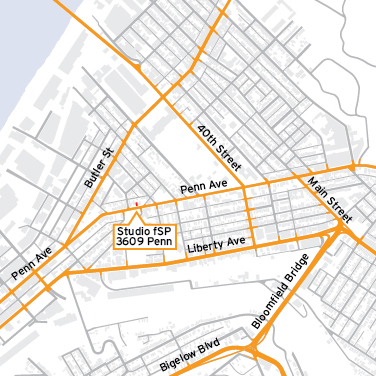 Our studio is located in the Historic Lawrenceville neighborhood of Pittsburgh. We are on Penn Avenue between 36th and 37th Streets. The office is the orange door on the right. Follow Liberty Avenue through the Strip to 32nd Street and make a left then a right to Penn Avenue. Follow Penn to 36th Street, staying to the right at Doughboy Square. The office is across the street from the Stephen Foster Mansion.